So lets start from the beginning. You will need one large recipe of Marshmallow Fondant. Remember, whenever you are connecting fondant to fondant, you will need a dab of water or vodka (the alcohol evaporates but you still need to use it sparingly). You need 2 cubes of gray fondant. Color white fondant gray, the shape into a cube (just make them as big or as small as you want them. The size of these boxes will be approximately the finished size of your TNT boxes). Red fondant. Not sure how much of this you will need - enough to cover the tops and bottoms of each TNT cube. Color some fondant black (a ball about the size of a large marble). From this, roll out letters to spell "TNT" on each box. Place the letters carefully on the boxes. You will need to have some black fondant left over so you can make the creepers faces. 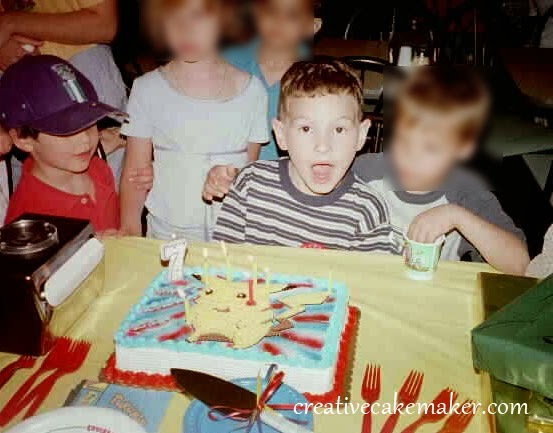 No Minecraft cake would be complete without at least one Creeper. For this cake, I made two. The more, the merrier, right? Obviously, you need green fondant. I left the coloring a little marbled so give the impression of the color variants in a creeper. For one creeper, roll out a cylinder/thick rope of the green. Cut into 3 sections, small, medium and large. The medium sized portion will be the head. The large portion will be the body. Cut the small piece in half to create two smaller pieces. These will be the feet. Flatten and shape each piece into squares. Connect the squares together with toothpicks to keep everything sturdy (these will need to be able to sit upright on the cake). The feet of one creeper should be placed ON the body section as shown below. This will be the seated creeper. The feet of the other creeper should be placed BELOW the body section as shown below. This will be the standing creeper. Pinch off SMALL pieces from your black fondant to form the eyes and mouth sections of each creeper. I rolled out a tiny bit and cut it into squares to further mimic pixels. Dab a smidgen of water or vodka on your creeper head and place the face pieces carefully on it. I heard somewhere that during an interview, the Minecraft creator was asked what the character's name was. Thinking on the spot, he said "Steve?". So there you go. 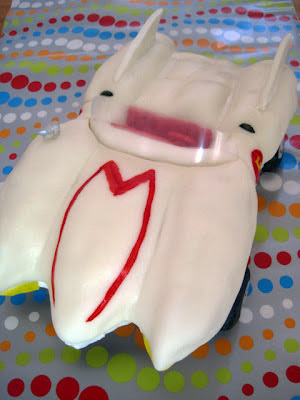 For this cake, I made him in his diamond armor. Why? Well, for starters, it seemed easier than messing with "hair". The second reason I had for doing this was that just last Halloween, Tristan chose to be Steve. We painted up a couple boxes and squeezed him inside them. It was interesting for him to walk around on Halloween in that box costume. and a smidgen of light brown fondant (darker than the beige) for the nose and mouth. As with the Creeper, you can leave the color a bit marbled to give the illusion of pixels. Square off all the pieces and connect together with toothpicks. Carefully place the facial features on Steve's head. Of course, if you don't plan to have a greeting here, or if you have an alternate plan, you can skip this step. Color a 2-3 inch ball of fondant grey. The size ball you use will determine the size of the plaque you wind up with. Roll it out into a rectangle and cut the edges straight. Set this aside and save any grey scraps for the next step. For this, you need a baked cake. I baked a 13 x 9 cake, cut it in half crossways, and then split each half so it had two layers each. I chose to ice the cake with chocolate because it was "land" and the chocolate could be the "dirt" However, I'm thinking now I should have iced the upper half green and the lower half brown so it would have more closely matched the placement of the fondant tiles. Speaking of the fondant tiles...you need a lot of them. I all shades of brown and green with a few grey tiles thrown in. With the creepers and "Steve?" and the TNT boxes and grey rectangle already made, You can dedicate the remainder of your fondant to land tiles. Brown: Take about 1/3 of your remaining fondant and separate it into several balls. Color each ball a different shade of brown. Grey: Pinch off about a 2 inch ball from the remaining fondant and color it grey (or, if you have some left over from the previous step, use that). Green: With all the fondant left, separate it into about 3 or 4 sections and color them each a different shade of green. I used everything from lime green to a grass and army green. Roll out each color and cut them into half inch squares. Try to be more accurate than I was. I was being impatient here and it shows in the finished cake. Once all your tiles are cut our, you can start to arrange them on your cake. You can start anywhere you want. I started with a corner. Try to mix up the colors as best you can and don't forget to put a grey block in there every once in a while (in both they brown and the green areas). This will take awhile, but keep going until the cake is covered. I made the green layers come down 2-3 layers. You can see below where it alternates with the brown there so the transition between the brown layer and the green layer is more muddled. The Minecraft sign was, thankfully, very easy. Find a Minecraft logo image online and print it on a color printer. Then laminate it or cover it with clear packing tape. Carefully wipe it down to clean it. And that's it! 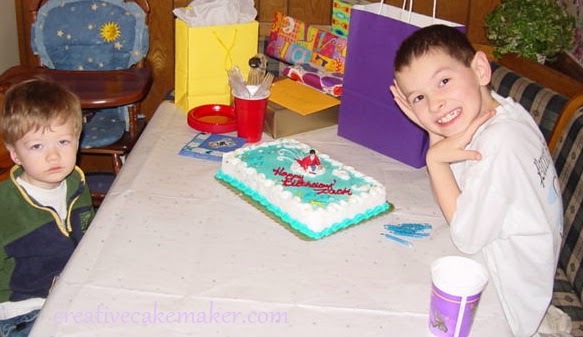 Place your name plaque on the top of the cake. You want it to be centered (left to right) on the front half. The back half is where all your fondant figures will go. This would be the best time to ice the greeting onto the name plaque - before everything else is in place. Ice the back of your Minecraft sign (this will act as "glue"). Place it on the front side of your cake. I used additional icing here to pipe a border around the sign to hide the edges. Push toothpicks into the bases of your fondant figures (Creepers and "Steve?"). Then place the figures on top of your cake. I actually had a couple toothpicks BEHIND the "Steve?" figure as added support (you can see them in the last image below). The TNT boxes shouldn't need toothpicks. You can just place those where you want them. And that completes your Minecraft Cake! Tia has recently discovered Harry Potter. The first movie came out before she was born. Later, her oldest brother (10 years older than her) was deep into Harry Potter and she could have cared less. In later years, the movies became too dark for her - she was still quite young - and she soon associated Harry Potter with "scary movies". Last month, that all changed. Tia rode with a friend to a birthday party and on the way there and back they watched The Sorcerer's Stone. She came home after the party talking about nothing but that movie. We rented it (and The Chamber Of Secrets) from the library. Her brother brought the next two movies for her to see. She wanted to be Hermione for Halloween and she immediately requested a Harry Potter birthday cake. 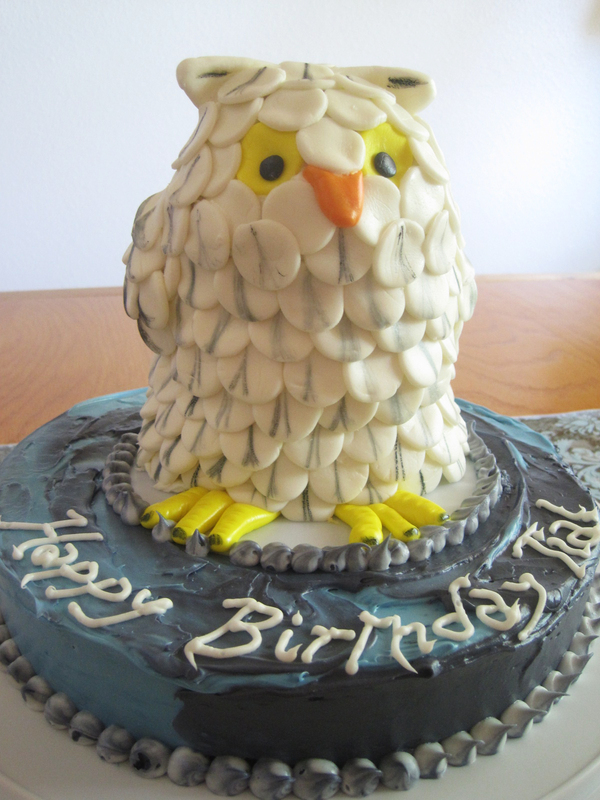 Early on, I came across a cute Hedwig cake I wanted to try to duplicate so I pinned it. I decided at the last minute to not include the Hogwarts book in the cake design. I didn't want to have too much cake (and leftovers) so I wound up with something similar that Tia kept ooohh-ing and aahh-ing over because "He's soooo cuuute!" The cake is a WASC (White Almond Sour Cream) Cake that starts with a box mix. I decided to use it because it because of the many layers I would need for Hedwig. You can find the recipe on Cake Central. One batch made a 10 inch and an 8 inch square cake. Once the cakes were cooled, I used a large (empty and clean) crushed tomato can to cut out several rounds from the 8-inch square cake. Stack the layers using some Pillsbury white icing between the layers. Wrap the whole stack together in plastic wrap and place it in the refrigerator (I found this made the stack much more sturdy). You can see in the photo above I have a chopstick running through the middle. After refrigerating the stack, I found I didn't need the chopstick (good thing too because even though I trimmed the stick, it was STILL too tall). While the stack is in the refrigerator, you can ice the base of the cake and work on your fondant. I chose to simply ice the base instead of covering it with fondant. Since the owl is white, I wanted some color to the base. I chose to swirl blue and purple together. Once iced, set the base aside and start working on your fondant pieces. This fondant is my usual Marshmallow Fondant. I made the feet using 3 small yellow ropes connected at one end for each foot. Those feet look big but about a third of them will be covered by icing and feathers.I also used yellow to make the eyes and cut them out using the wide end of a 2D Wilton decorating tip. I used the same tip to cut out all the "feathers" from the white fondant. The ears were made from white fondant. Form two sections of fondant into triangles about 1/4" think and 1 1/2 inches across. A small amount of fondant was colored black and rolled into tiny balls for the eyes. 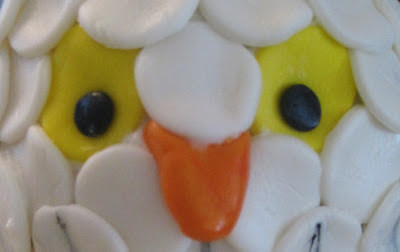 I added a smidgen of red coloring to a small batch of leftover yellow fondant to make it orange for the beak. The feathers were painted with a brush dipped first into almond flavoring and then swiped across black gel coloring. I just wanted to pick up a small bit of the black color for "painting". I left about 12 feathers un-painted to be placed around the face. With all the fondant pieces made, you're ready to put Hedwig together! Place the feet at the front of your decorating surface then pull the cake stack out of the refrigerator and place it on your decorating surface over the feet. I placed the cake directly on a tier I planned to place on the cake base. If I had it to do over, I would cover the tier with fondant first and have it drape over the sides. Carve the top of the cake to round out the head. I used scraps from the head to add bulk to the sides where the wings should go. This is totally optional and actually not shown in the photo below. Ice all around the base of the cake stack with white icing making sure there is no cake showing. You only need to ice about 2 inches up for now. Start placing feathers all around the base. Once you have made the first row of feathers, ice a little higher and start on the second row of feathers overlapping the first row. Continue this all the way up to the top of the wings. I did not cover the wing areas in this step. I came back and finished them last so they appeared to be above all the other feathers. Before starting on the head, ice the ears into place. Then place the eyes and surround them with the unpainted feather pieces. Place the beak in place. Continue to finish the head with the painted feather pieces starting where you left off at the top of the wings and finishing up at the top of the head. You can use your paintbrush to paint black on the tips of the toes and the insides of the ears. Place the finished owl on top of your 10" cake base and trim as desired. For this cake I simply piped icing around the cake base and around the owl base. I was looking for quick and easy! All done! Place you candles and enjoy! Clearly, he didn't want me to believe he was anything more than a cartoon character. Still, I pushed and wound up with a real photograph. At least he didn't tell me he was Yoda. I might have run in the other direction without bothering to ask for that second picture. Here we are, 13 years later. 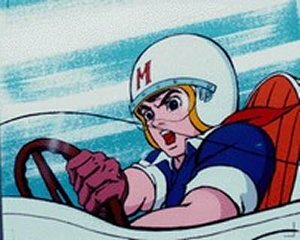 He still loves Speed Racer and (probably most especially) the Mach 5. It was time I made him a cake that paid tribute to that love. 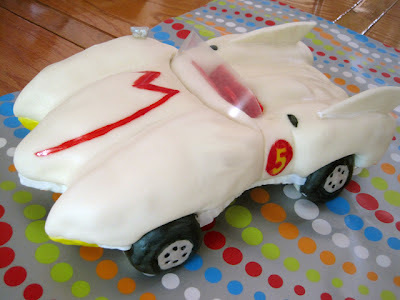 I ran across a tutorial on instructables.com for a Mach 5 cake and KNEW it would be the next project. I'm not going to go through the entire tutorial here. You can follow the link directly to it. I'll just touch on some of the details I went through in making the Mach 5. The tutorial didn't have a template. 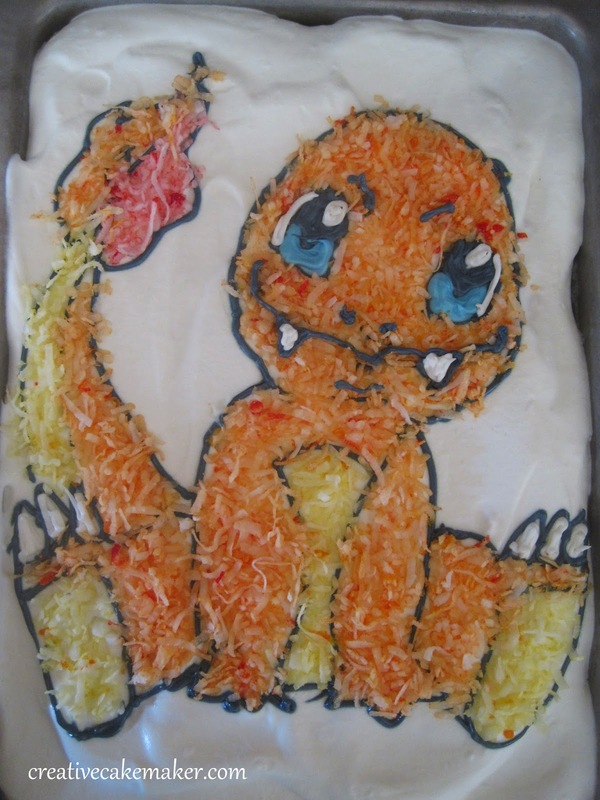 I could tell from one of the tutorial pictures that the cake was approximately 7" x 14". Since I didn't have cake boards large enough (and I was cutting up regular cardboard to use instead), I sized it down to 7" x 12". This would also work for my 13"x9" cake pan. Cut out your 7" x 12" rectangle from corrugated cardboard (or cake board) and draw on a grid of 1" blocks. The pillars for the cake board were created and attached just as shown in the tutorial. I also used the cake batter mentioned in the tutorial - a WASC (White Almond Sour Cream) Cake that starts with a box mix. I decided to use it because it is supposed to be great for carving and this cake was going to need a LOT of carving. You can find the recipe on Cake Central. I made 1 batch of the cake batter to fill up a 9x13" pan. As you can see, it REALLY filled up the pan. I used floss to cut the cake into three layers then iced between the layers. Then I chilled it and cut the basic shape out using the cardboard base template. I wasn't sure how much icing I would need, so I bought 3 containers of white. I didn't want to bother with buttercream since the house is SO HOT this time of year...and no AC. I used about 2 1/2 containers of icing. I made marshmallow fondant to cover this cake - one batch was more than enough. The wheels wound up needing to be a lot smaller than I thought at first. The rice krispie treats used to shape the tires was only about 1-1/2" diameter for each tire. I didn't wrap the fondant underneath the cardboard base like it is shown in the tutorial so I piped icing around the base to cover the foil. Once the cake was carved and iced, I should have let the cake sit longer before adding the fondant. Then I could have smoothed out the icing a little better. As it was, the icing was a bit lumpy (too much icing in some places) causing the fondant to be lumpy in some places.